Ideal for a multi-family vacation! Sleeps 12 - 6 adults and 6 kids. 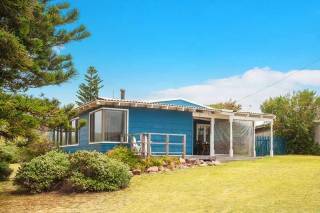 Located on the ocean side of Augusta the house has panoramic views of the Southern Ocean and is a 100m walk to the ocean. Winner of the RIAA Residential Home Award 2009 and a finalist in the 2008 MBA Awards, this contemporary coastal house has a discernible intimate relationship with the environment. No need to pay for a whale watching cruise because you can watch them from the main outdoor area or the balcony attached to each bedroom. 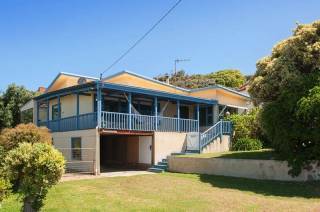 The house has a substantial lawn area and a cricket net to entertain the kids. 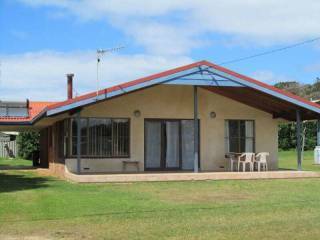 This house is ideal for a weekend getaway or a longer stay for a small or large group. 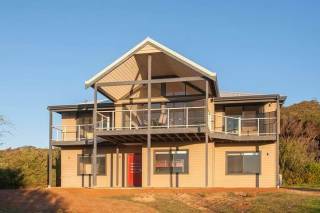 With 3 separate bedrooms and a bunk room sleeps 6 the house can comfortably accommodate two families. There is a separate kid’s entertainment room which adjoins the bunk room. The modern kitchen includes two ovens, large fridge and a dishwasher. The kitchen opens out via large bi-fold doors onto a deck / grass entertaining area containing a large outdoor fireplace. Kitchen downstairs with fridge and freezer, microwave, stove gas burners and oven, dishwasher, crockery, cutlery, saucepans, electric frying pan, coffee plunger, wine glasses, TV etc. Dogs welcome but please enquire first. 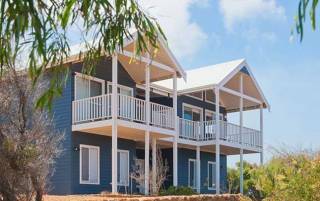 Local attractions include the Cape Leeuwin Lighthouse, Flinders Bay and the Blackwood River. Or you can do nothing – spend hours just looking at the view. For golfers you can play “Augusta” also known as the Hillview Golf Course. 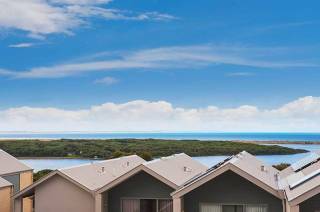 Walk to the beach or the river or drive to the many other attractions in the Margaret River Region. Please respect our house while spending time with your family and friends. DEPOSIT - A $300 non-refundable deposit is required to confirm all bookings. An email confirming receival will be sent. Full rate is payable for bookings under 30 days. You will be invoiced for the balance 30 days before your booked date. Directions will then be forwarded to you once payment is received. SECURITY BOND - a refundable security bond of $600 is payable via direct bank deposit. The bond will be refunded via direct bank deposit within 3 -7 working days after you vacate. Your full bond will be forwarded provided there are no damages, excess cleaning or other expenses incurred such as barbecue issues. NUMBER OF GUESTS - The number of guests occupying the property for the duration of the appointed dates must not exceed the number specified on the booking form. Please inform immediately of any changes to the number of guests. Failure to do so may result in extra tariff or cancellation of the booking. BEHAVIOUR - It is the responsibility of all guests to behave in a manner not to cause any damage, offend neighbours or create additional cost. Any complaints may lead to additional expenses; these additional costs may lead to extra charges via credit card or forfeiture of the bond. UNDER NO CIRCUMSTANCES ARE PARTIES, FUNCTIONS or SOCIAL GATHERINGS PERMITTED IN THE HOUSE. CANCELLATION POLICY – Initial deposit of A$300 is non-refundable. If you require cancellation after you have paid the full amount we will open your dates and try to get a new booking. If we can cover your payment we will refund completely. If we cannot cover your booking then partial or full payments will be forfeited. Cancellations and amendments are required in writing, preferably via email. DOGS & PETS - pets are permitted. Please enquire beforehand regarding suitability. KEYS – All guests are met on arrival. LINEN & TOWELS - This can be arranged. Please enquire separately. GUESTS RESPONSIBILITY - Guests are expected to respect and take good care of the property entrusted to them. This includes all furnishings and equipment. We have a NO SMOKING INSIDE POLICY failure to respect this policy will result in extra cleaning and dry-cleaning costs and nightly rates while property is being cleaned. Any faults, damages or breakages must be reported. Guests will be liable for any breakages or damages caused to the property during the guests holiday occupation and all costs of repair and replacement shall be either taken from the bond. It is the responsibility of the guests to ensure that all doors and windows are securely locked and that the property is left clean and tidy with dishes washed and put away and BBQ cleaned. Any extra cleaning will be charged at $50 per hour. If BBQ is not left clean or the gas bottle has been deliberately drained there will be a $50 fee from your bond. LOST PROPERTY – It is the responsibility of guests to check before departure that personal belongings have not been left in the house. A minimum charge plus the cost of retrieval, post and packaging (paid in advance by credit charge) will apply if any lost property is to be returned to guests. Full Directions and house particulars will be supplied once deposit is recieved.